The Disney Vacation Club — What’s it all about? This collection is made up of resort locations that are available in an exchange with RCI or Buena Vista Trading Company. There are something like 400 resorts available all over the world, and if you elect this route, the cost for you is a $95 transfer fee. This collection offers a select choice of fine hotel choices in various locations, with fine dining packages and other amenities. People who select this collection will be able to examine the Adventures by Disney selections, and can use their points for these destinations! 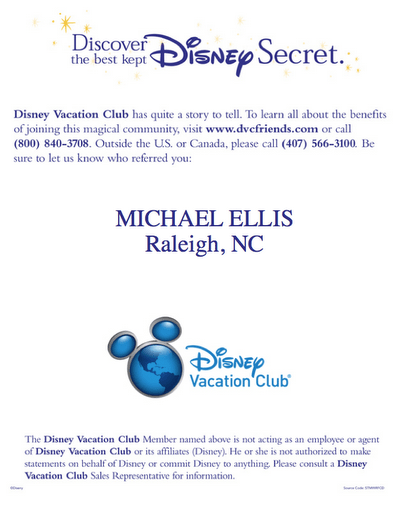 The first thing to do if you are considering purchasing DVC is to either take a tour when you are visiting one of the parks, order the Disney Vacation Club DVD, or call the phone number on the image below. If you tell them that I referred you, I believe that we will both get a special reward! However, I’ve never referred anyone, so I could be wrong on the reward. Special Incentives Upon occasion, the sales folks at DVC will offer incentives to people that are buying ownership in DVC. When we purchased, we were looking at purchasing as our home resort (more on that later) either Bay Lake Tower at Disney’s Contemporary Resort or Disney’s Animal Kingdom Villas. However, we ultimately decided to purchase our points through The Villas at Disney’s Grand Californian® Resort & Spa. There were a couple of reasons, which I’ll elaborate on next. One thing I didn’t mention is that when you purchase an interest, your ownership interest is for fifty years minus the length of time that the resort has been open. For example, if we had purchased at Old Key West, which opened in 1991, we would have been able to have our ownership interest until the year 2042, which is about 50 years after OKW opened for business. So, for us, we would have been able to stay there for 32 years since we purchased in 2010. However, since the Grand Californian opened in September, 2009, the DVC end date is January 31, 2060, so we’ll have our interest for a full 50 years. When we purchased, GC was about to sell out — so the sales folks were all about finishing up that resort. Because of that, when we purchased our points, we were also given the current years points as a free add on, so for 2011 we had 440 points available for use. We also got a discount on the cost of the points by purchasing at Grand Californian, so our purchase price was less than at other resorts. In June 2010, we banked our 2010 points to 2011, which gave us a total of 440 for 2011. We reserved a two bedroom suite at BLT in November 2010, which cost us 384 points. This left us with 56 points. We banked those points from 2011 to 2012 use year. So, for 2012, we now have 276 points. For 2012, we are looking at staying at Animal Kingdom Lodge, and since we will have some family and friends with us, we are thinking about getting our two bedroom suite with a Savannah View, if it’s available. Because of that, the cost for that view in points is 345 points, based on the dates we want to go. Since we only have 276 points available for 2012, we will borrow some of our points from 2013. To make this reservation, we will have to borrow 69 points, which will leave us with 151 points for 2013. Summary In essence, a purchase of a membership in the Disney Vacation Club is a purchase for hotel lodgings for the next fifty years. What makes the Disney Vacation Club different is that you can stay at Disney Resorts near the parks, or you can stay at Hilton Head Island, or Vero Beach, or you can decide to trade your points for other lodgings at destinations across the world! Also, you can choose to use your points at any time during the year that you want, not for a certain week at a certain resort every year. All of these things, plus the proximity to Walt Disney World and Disneyland, made the choice for us a really simple one. Couple that with the realization when we were doing the tour that we could have paid about half of our ownership costs if we had purchased a few years earlier, just really made the cost a smart one for us. One thing that I didn’t cover in my discussion was the maintenance fees. Every resort has maintenance fees, and for us, we are paying them with a monthly draft. You can also pay them in one lump sum each year. Your ownership cost can be paid with cash, credit card, or you can finance them through DVC. A purchase in DVC is basically a purchase of a second home, so any interest you pay if you finance the purchase is considered real estate interest, and may be deductible on your taxes depending on your circumstances. I hope that I have helped you all to understand the Disney Vacation Club a little better. I know that there are a lot of details, so if you are at all interested in DVC, I urge you to call them up. Just tell them that Michael Ellis from Raleigh, NC sent you! If you have any other questions, please feel free to ask them in the comments! Welcome Home!